The idea of categorising and quantifying a child’s emotions sits uncomfortably with me and seems to go against the principles of forest school. Many organisations, schools in particular, require impact assessment to justify funding sources, such as pupil premium, being used for forest school sessions so it’s something that forest school practitioners are often obliged to do. Some form of framework for observations can also be useful in identifying children’s needs and tailoring future sessions to meet them. Initially I mimicked the form in the handbook (Forest School – learner observation form) but didn’t really get along with it. I’ve created a Forest School observation chart which works better for me. This is the first version and the form a little sparse but served it’s purpose. There are a number of changes that have been made since, notably amending the label in the centre to read ‘Emotional Intelligence’ and adding areas to record age, gender and notes. 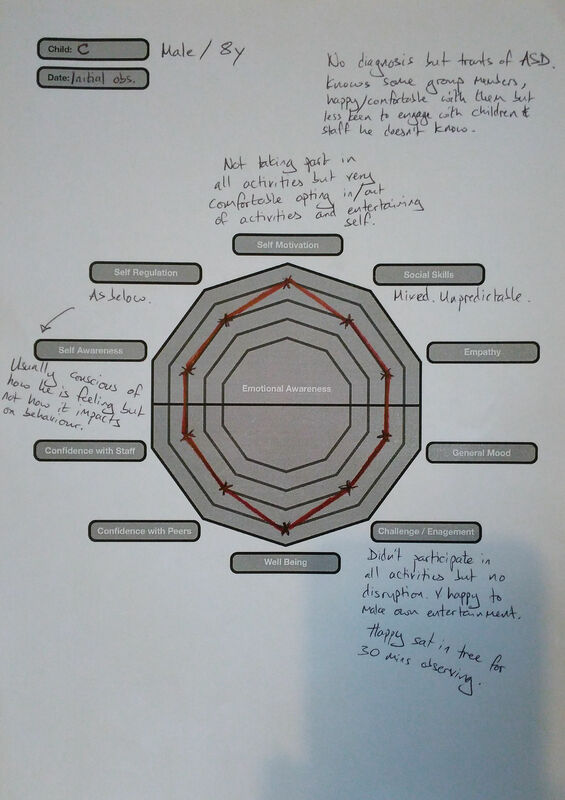 It’s essentially a radar chart that captures very similar data to the handbook form but in a different format. The first 5 are from Daniel Goleman’s mixed model of emotional intelligence. The remaining 5 are the elements I thought would provide the most useful information to support planning future sessions. During the observation session the child is given a score on a scale of 1-5 for each element. 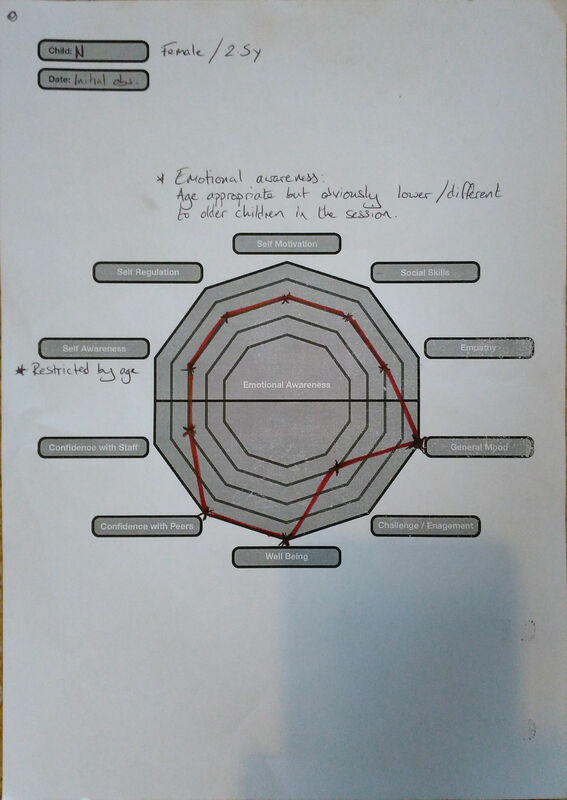 The points on the chart are then joined to create a complete polygon whose area represents the child’s emotional state during the observation. When completed it’s a much more visual way of measuring impact or lack of. Multiple observations can also be recorded on the same chart, further highlighting any progress. It’s also possible to generate quantifiable data from the chart if that’s your thing. Count how many steps each element has progressed and the sum can be used to give an impact ‘figure’. For example if a child at their second observation increased by one point in both self awareness and self regulation then the overall impact of the sessions in the duration between the observations would be 2. If a child increased by one step in every element then the impact would be 10 and so on. 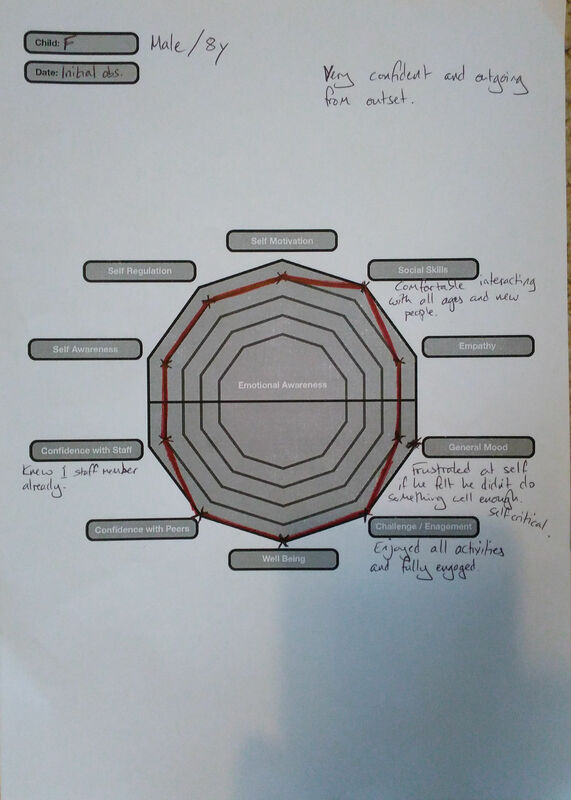 With older children it would be possible for the forms to be filled in by session staff or by the young people themselves to support development of reflection skills and self evaluation. 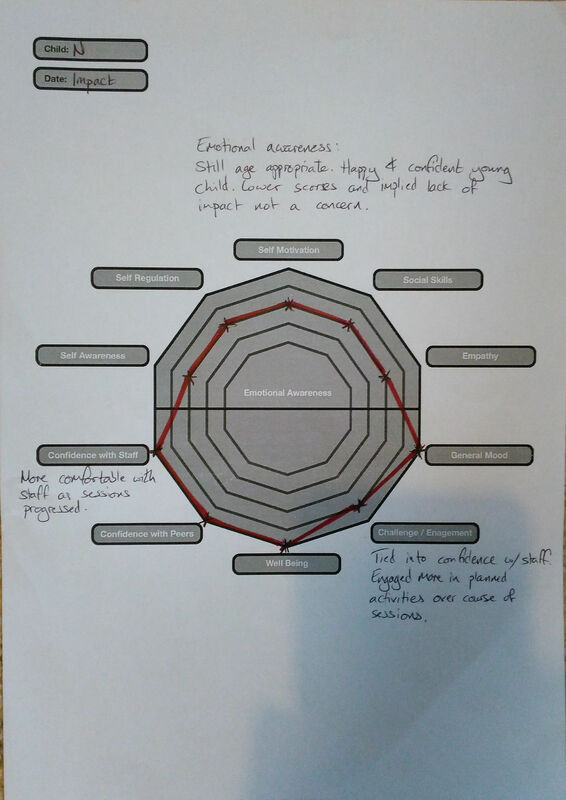 I’ve used similar tools in education and youth work, including the Outcomes Star and found them useful tools that provide a comfortable balance between providing a framework for observation with flexibility to consider the child holistically. As tool to observe the children I felt it worked really well. I’m in the process of creating a nicer looking observation form along with descriptions for each element and a guide on how to use it. 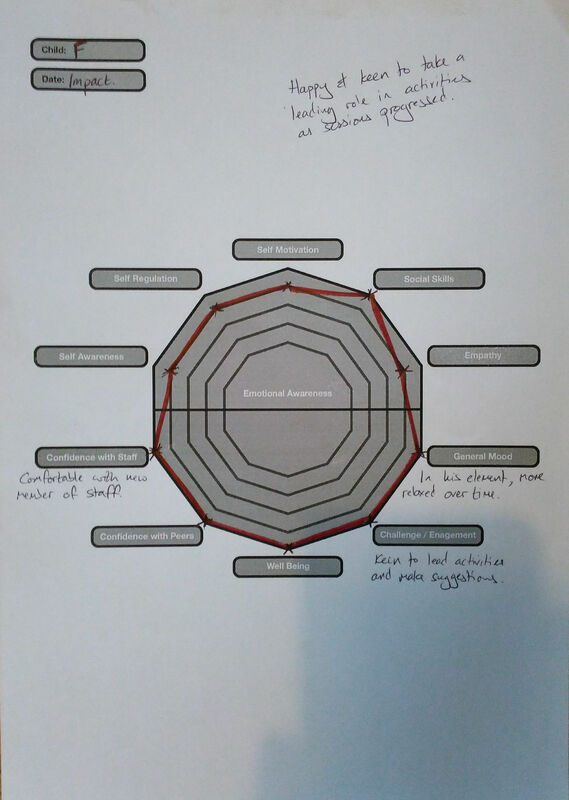 Below are copies of the initial and impact observations I carried out on three children during my portfolio sessions. The observations were just that, my perceptions of the children during the time I worked with them and how I perceived them to have developed and progressed. All showed impact but six sessions is a relatively short amount of time to work with a child. To increase the chance of significant and/or long lasting impact sessions would need to be regularly run with the same children over a much longer period of time. C is an 8 year old boy. He has no diagnosis but displays traits of autism spectrum condition. At the start of the sessions C already knew 1 of the two members of staff and several of the other children in the group. Initially C was comfortable interacting with the member of staff and children he knew but more reluctant to engage with those he had not met before. On one of the first sessions he took himself off and sat in a tree and observed the group for around half an hour before rejoining as a game started. Over the course of the sessions as he became familiar with others the frequency and variety of social interactions increased. C’s empathy towards others remained variable throughout the sessions. Whilst it did improve over the course of the sessions, as he got to know those he had not met before, there was still a level of unpredictability as to how he would respond to disagreement. C’s level engagement with the activities did increase over time, prompted largely I believe by familiarity with the group, but even in the last sessions he still chose to opt out of some. Throughout the sessions though he was never disruptive of activities and if he chose not to join in was comfortable and happy to entertain himself. I did score C relatively low initially on several elements. I think the improvements over the sessions were predominantly down to increased familiarity with both the site and other members of the group. Given the chance to continue in the same group and in the same location I think would support development in all areas. F is also an 8 year old boy. At the start of the sessions F already knew several of the other children but from the outset was very confident and comfortable and effective during interactions with both staff and children he did not know. Throughout the sessions F was fully engaged in and enjoyed all of the activities. 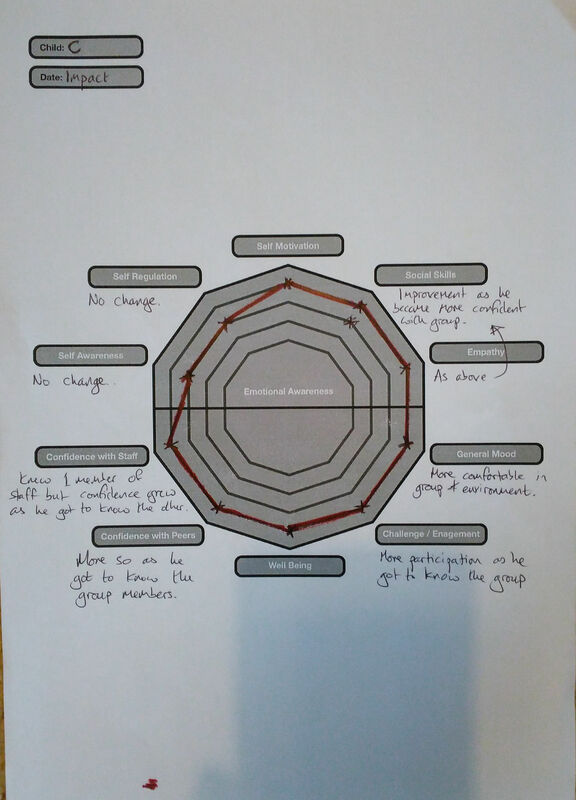 As the sessions progressed he was keen to take more ownership of the sessions, make suggestions about how activities could be adapted and to take on the role of leader. F clearly set himself very high targets and could be self critical if he did not complete a task as well as he felt he should have. He displayed impressive self awareness though and several times I witnessed him, when becoming frustrated with a task, either changing his approach or leaving the task entirely and pursuing something completely different. F presented as a very self aware, happy and emotionally stable child. The small increases in confidence with staff and mood were down to him being more relaxed as he got to know the group but did not inhibit him in anyway at the outset. I think it is fair to say that F was in his element playing in the woods. N is a 2 ½ year old girl. N knew several of the children in the group before the sessions. The group was of mixed age and she was the youngest. The oldest child was 10 years. N knew one member of staff but very quickly became comfortable with the member of staff she had not met before, often choosing to initiate interactions with them. Initial level of engagement in activities was relatively low. Initially N would choose to play, happily, by herself. As the sessions progressed she was increasingly actively involved in and engaged with more of the activities. I think this was down to a combination of staff getting to know N and being better able to adapt activities to her and partly to N becoming increasingly comfortable with staff and children in the group. I scored N relatively low on all elements of emotional intelligence at both the initial observation and during the impact observation. Her behaviour in all areas though was age appropriate. She presented as a happy and confident two year old and the low scores and implied lack of impact was not a concern.